"Our biggest gratitude goes to our sponsors for their trust. The constant support and the quality of the products they provide are key for the team’s success". Horseware started with a small team, in Dundalk, Ireland in 1985. After months of research and hand-stitching the prototype of the now iconic Rambo Original was born, setting the standard for modern rug design. Since then we have grown to become the world’s most trusted producer of horse rugs. We never stop evolving; we’re always seeking out untrodden paths, pushing boundaries and finding new challenges. 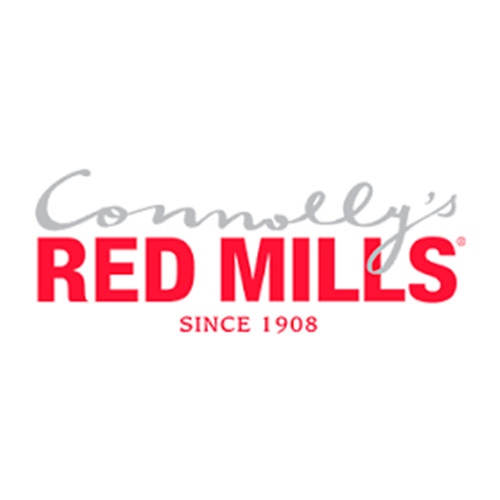 Connolly’s RED MILLS is quite literally the feed of champions, and is trusted by leading owners and trainers worldwide. Our horse feed formulations provide all the nutrition high performance animals demand, using the finest of fresh, natural ingredients to support digestion, wellbeing and performance. With our feeds you can be confident you are feeding a fully balanced diet, perfectly tailored by our expert nutritionists, to deliver all your horse's dietary needs. We work closely with vets and research departments of leading universities to bring the latest nutritional technology to our products, and to you, our valued customers. Equo is a mobile app (both android and iOS devices) that connects horse owners, trainers, and riders with shippers all around the United States. Using cutting edge technology, our app allows users to request a trip from any starting point to any destination within the US and Canada, receive instant free quotes, have GPS live tracking for your trip, make credit card payment, see driver’s information prior to the trip, get live notifications and much more! Meticulous attention to raw materials, employment of the most cutting-edge technologies and an obsessive attention to every small detail is the foundation of our success. Above all, though, there is the collaboration with the endorsements which are involved in the design and testing phase, thus guaranteeing total reliability of the product. Every rider wants the best protection available on the market for his/her horse, one cannot settle for less. This is why Veredus was able to win the trust of champions. Enviro Equine & PET products are made with all natural, organically sourced ingredients. All of our grooming products are chemical free, cruelty free, and enriched with essential oils and nourishing ingredients. We hand pack each product on a daily basis for guaranteed freshness and traceability. EnviroEquine & PET has blended the best of nature and science to give your family’s best friend what he needs to be healthy – everyday. We wouldn’t think of giving our own horses or pets anything else. Parlanti International specializes in fine Italian riding wear and fashion. Our goal is to make this amazing brand easily accessible to everyone in the USA and Canada, while maintaining the highest standards that have made Parlanti the “go-to” brand for so many years. We are very proud to present a new young sport horse auction. The Ten will be a very strict selection of 10 exclusive talented young show jumpers. This first edition consists of five to seven year olds horses who have already proven themselves on the showground. The Ten will be held on the 18th of April 2017, the day before Jumping Antwerp, in Azelhof, Lier - Belgium. The values f our auction are more than just quality, also transparency and satisfied customers are our top priority. Our team consists of experts from around the world. Daniel Bluman already participated twice at the Olympics. Carlo Pfyffer is a very known and respected Swiss rider, trainer and trader. Ilan Ferder and Tal Milstein have already built a strong reputation in the show jumping and dealing world and Gilbert De Roock is known for his exceptional ability to discover promising horses. All the horses of the auction are not only strictly selected but also trained by our team.